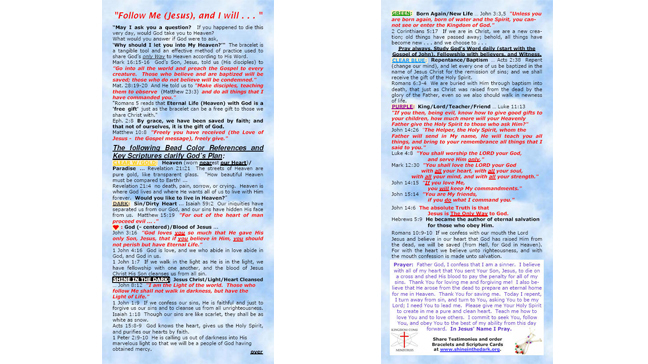 Salvation Bracelet Scripture Cards 4" x 9"
For Salvation Bracelets, Wristbands, Key Rings, and Zipper Pulls. 4" x 9" envelope-size Reference Guide for Gospel Witnessing includes pertinent Scriptures for sharing God's Plan of Salvation while using a Salvation Bracelet. Thus, making it a perfect Study Guide for Evangelism Preparation. Explains the use of Salvation Bracelets, Silicone Salvation Wristbands, and Salvation Key Rings / Zipper Pulls bead / color meanings. Prayer of Salvation on reverse. "Follow Me (Jesus) . . . "
"May I ask you a question? If you happened to die this very day, would God take you to Heaven?" What would you answer if God were to ask, "Why should I let you into My Heaven?" The salvation bracelet is a tangible tool and an effective method of practice used to share God's only way to Heaven according to His Word. Mark 16:15-16 God's only begotten Son, Jesus, told us (His disciples) to "Go into all the world and preach the Gospel to every creature. Those who believe and are baptized will be saved; but those who do not believe will be condemned." Mat. 28:19-20 And He told us to "Make disciples, teaching them to observe (Matthew 23:3) and do all things that I have commanded you." "Romans 5 reads that Eternal Life (Heaven) with God is a 'free gift' just as the bracelet can be a free gift to those we share Christ with." Eph. 2:8 By grace, we have been saved by faith; and that not of ourselves, it is the gift of God. Matthew 10:8 "Freely you have received the Love of Jesus - the Gospel message, freely give." Revelation 21:4 no death, pain, sorrow, or crying. Heaven is where God lives and where He wants all of us to live with Him forever. Would you like to live in Heaven?" DARK: Sin/Dirty Heart... Isaiah 59:2 Our iniquities have separated us from our God, and our sins have hidden His face from us. Matthew 15:19"For out of the heart of man proceed evil ... ."
RED: God (- centered)/Blood of Jesus ... John 3:16 "God loves you so much that He gave His only son, Jesus, that if you give your heart to Him, you should not perish but have Eternal Life." 1 John 4:16 God is love, and we who abide in love abide in God, and God in us. 1 John 1:7 If we walk in the light as he is in the light, we have fellowship with one another, and the blood of Jesus Christ His Son cleanses us from all sin. SHINE IN THE DARK: Jesus Christ/Light/Heart Cleansed ... John 8:12 "I am the Light of the world. Those who follow Me shall not walk in darkness, but have the Light of Life." 1 John 1:9 If we confess our sins, He is faithful and just to forgive us our sins and to cleanse us from all unrighteousness. Isaiah 1:18 Though our sins are like scarlet, they shall be as white as snow. Acts 15:8-9 God knows the heart, gives us the Holy Spirit, and purifies our hearts by faith. 1 Peter 2:9-10 He is calling us out of darkness into His marvelous light so that we will be a people of God having obtained mercy. GREEN: Born Again/New Life ... John 3:3,5 "Unless you are born again, born of water and the Spirit, you cannot see or enter the Kingdom of God." 2 Corinthians 5:17 If we are in Christ, we are a new creation; old things have passed away; behold, all things have become new . . . and we choose to . . .
Pray always, Study God's Word daily (start with the Gospel of John), Fellowship with believers, and Witness. BLUE: Repentance/Baptism ... Acts 2:38 Repent (give our heart back to Jesus and surrender to His will) and let every one of us be baptized in the name of Jesus Christ for the remission of sins; and we shall receive the gift of the Holy Spirit. Romans 6:3-4 We are buried with Him through baptism into death, that just as Christ was raised from the dead by the glory of the Father, even so we also should walk in newness of life. PURPLE: King/Lord/Teacher/Friend ... Luke 11:13 "If you then being evil, know how to give good gifts to your children, how much more will your Heavenly Father give the Holy spirit to those who ask Him?" John 14:26 "The Helper, the Holy Spirit, whom the Father will send in My name, He will teach you all things, and bring to your remembrance all things that I said to you." Luke 4:8 "You shall worship the LORD your God, and serve Him only." Mark 12:30 "You shall love the LORD your God with all your heart, with all your soul, with all your mind, and with all your strength." John 15:14 You are My friends, if you do what I command you." John 14:6 The absolute Truth is that Jesus is The Only Way to God. Hebrews 5:9 He became the author of eternal salvation for those who obey Him. 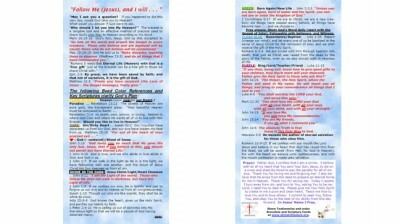 Prayer of Salvation: Father God, I confess that I am a sinner. I believe with all my heart that You sent Your Son, Jesus, to die on a cross and shed His blood to pay the penalty for all of my sins. Thank You for loving me and forgiving me! I also believe that He arose from the dead to prepare an eternal home for me in Heaven. Thank You for saving me. Today I repent, I will follow You in Spirit and Truth, and my only Life. Please give me Your Holy Spirit to create in me a pure and clean heart; teach me how to love You and love others. I put my trust in You to lead me to become faithful to You wholeheartedly. In Jesus' Name I Pray.